Renting a portable restroom is actually a pretty simple thing, once you know to call VIP To Go for unparalleled service and selection. But before you rent ensure you are informed by reading our entire Restroom Trailer guide, or at least cutting to the chase with this list of important things to know. Restroom trailers are clean and spacious. Restroom trailers include hot and cold running water. VIP To Go offers the best customer service in the restroom trailer business. Portable shower trailers include hot running water. Restroom trailers can run off a single, standard, 110 volt outlet. In the absence of an outlet, you can run a restroom trailer from a generator, which VIP To Go can supply. Restroom and shower trailers require only a standard outlet and a garden hose to run. If you don’t have a garden hose available VIP To Go trailers have huge water tanks to allow ample water without a water supply. VIP To Go has worked with FEMA to provide portable restroom trailers after emergencies. 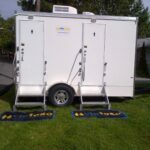 Portable restroom trailers are perfect for large sporting events. VIP To Go custom orders their trailers to have extra large supply and storage tanks. 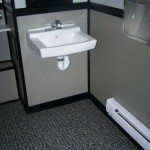 All our restroom trailers include electric lights, ventilation, running water and more. VIP To Go is available 24 hours a day, 7 days a week for emergency situations. VIP To Go is highly experience in delivering portable restroom trailers to small city lots and in other cramped spaces. Restroom trailers are perfect for campouts and family reunions. VIP To Go has the knowledge to help with toilet trailer placement; we can help place a trailer in a small lot but also choose the right placement for large lots and events. Restroom trailers are much more comfortable than the standard blue box chemical toilet. VIP To Go has over 150 restroom and shower trailers, making ours one of the biggest fleets in the nation. VIP To Go offers rental toilets for small weekend parties. VIP To Go also has fleets of trailers available to do large jobs – we can accommodate any need. Our huge restroom trailer fleet can be mobilized to serve you anywhere in the country. VIP To Go maintains fleet yards across the United States; we store units in New York, New Hampshire, Florida and beyond! VIP To Go can order a custom built trailer for those with unique needs. VIP To Go offers a free site walk-through to help you ensure the perfect placement of your restroom trailer. Restroom trailers are a great choice for outdoor art fairs. VIP To Go can be a valuable part of your emergency planning process. With VIP To Go you always get a single price quote that includes restroom trailer, site walkthrough, delivery, supplies – everything (except tax, of course), with no surprises, ever. When you provide your work crew with clean, attractive restroom trailers they will feel more valued and appreciated. VIP To Go offers ADA compliant portable restroom trailers. When it comes to water use, our toilets are designed to be low flow, using as little water per flush as possible. VIP To Go offers ADA compliant shower trailers. Blue box portable toilets have small tanks of about 65 gallons, but restroom trailers have tanks of up to 1200 gallons! VIP To Go has restroom trailers that can handle 1,000 uses before they need to be emptied! With VIP To Go paper and supplies are included in your rental price. VIP To Go trailers are virtually maintenance free, but we can arrange an attendant for you if you want that extra touch of class! Restroom trailers are perfect for weddings. Most of our customers come from repeat business and client referrals. VIP To Go restroom trailers go through a comprehensive sanitation process between uses. At VIP To Go we replace our trailers with brand new models every 12-18 months, ensuring that you always get the newest, best trailer available. VIP To Go sells our used portable restroom trailers to other restroom trailer companies. VIP To Go buys so many trailers that we receive a huge discount that we pass along to you in our pricing. Each one of our trailers goes through a five point disinfection process, from floor to ceiling, before you receive it ensuring that it is healthy at all times. At VIP To Go we design our trailers to be as environmentally friendly as possible. With restroom trailers we do not use chemicals in an effort to mask odor; instead, waste is removed to a storage tank. At VIP To Go we actually design our portable toilets and work with the engineers who create them. Our ADA compliant trailers have lower sinks, access ramps, hand rails, spacious interiors and wider doors. VIP To Go restroom trailer rentals for a weekend can range from $900 to $3500, depending upon the options that you choose. One of the huge benefits that VIP To Go offers our large, national organization partners is one-stop shopping for all your needs, around the country. Not only is a porta potty trailer rental more attractive and cleaner than a chemical blue box porta-potty, but they are also more luxurious. While we have a large supply of rental restroom trailer and shower trailers, to get the trailer that best suits your needs and budget you should call us as soon as you know the dates of your event. 3 Reasons why with a VIP To Go restroom trailer rental Tampa gets the best of summer with variety and the best of winter with discount rates. The 15’ party unit is a stylish 5 station restroom trailer. It features 2 urinals, 1 stall and 1 sink in the male side and 2 stalls and 1 sinks at the female side. At VIP To Go we have made a commitment to providing sanitary restroom trailers and showers wherever they are needed, around the country. When you contract with VIP To Go you can know that your organization or municipality is ready if disaster does strike, as our team can mobilize quickly, around the country, to bring the facilities that you need, where you need them, fast. What’s more, with VIP To Go you get one stop pricing wherever you need it, so planning for disasters in a national organization is easier than you can imagine. Portable Toilet Trailer: Should You Go Big Or Small?